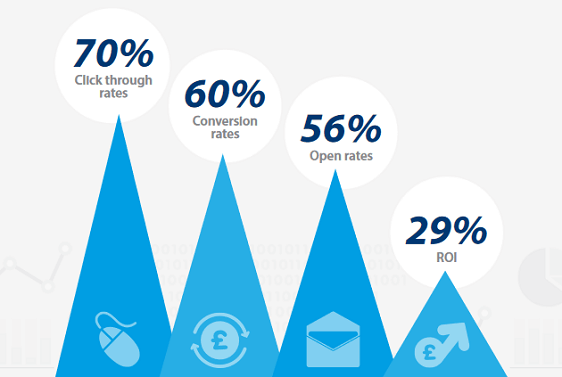 Do you want to know which email marketing metrics are the most important to track? Being able to narrow down the metrics you analyze can prevent you from becoming overwhelmed and show you how your email marketing efforts are doing. In this article, we’ll discuss the top email metrics you should be tracking. Email metrics are important to measure so you can see how well your email campaigns are doing. After all, if your subscribers open your emails, but don’t click through on the call to action button, you’ll never be successful. And there are plenty more reasons too! However, no matter why you want to track email marketing metrics, it really all comes down to finding out how well your email campaigns are performing. Now, let’s take a look at the top email marketing metrics that will matter most to your long term success. Your email’s open rate is the percentage of people that have opened your email. This email marketing metric helps you determine how likely it is that people will read your email’s content. If you use any of the top email service providers on the market today, they have already calculated your email open rates for you. However if you want to do the math yourself, just divide the number of unique opens by the number of emails sent, minus the number of bounces. According to IBM’s 2016 Email Marketing Benchmark Study, the average email open rate in the United States was 21.5%. Of course, depending on your email service provider and industry, your own email metrics may be higher or lower than the average. One of the best ways to get new subscribers to open your first set of emails is to offer a valuable content upgrade as a reward for signing up. From there, keep the email subject lines engaging and the content within them exciting, so every time a new email lands in a subscriber’s inbox, they can’t wait to see what you’ve sent. Your email’s clickthrough rate is the percentage of people who click on the links you’ve added to your email. This email metric is easy to calculate on every single email you send out. It’s also easy to see over time whether the percentage goes up or down. The clickthrough rate of emails give you an idea as to how likely it is your subscribers will engage with your email’s content. It’ll also show you how interested people are in learning more about your brand. 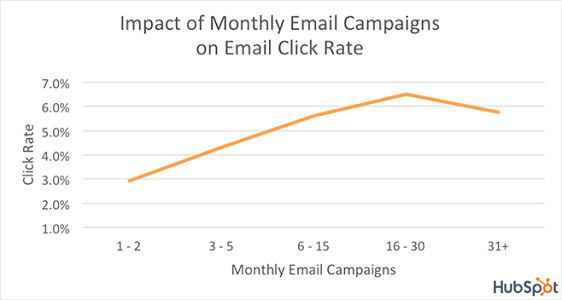 According to HubSpot, companies that send 16-30 email campaigns a month see a clickthrough rate that’s 2x greater than those sending out fewer than 2 campaigns a month. 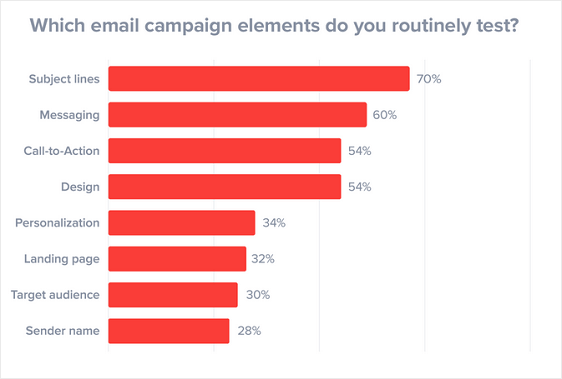 Keep in mind, these statistics refer to targeted email campaigns sent to a particular group of people, not an email blast to everyone on your email list. For help with segmenting your MailChimp subscribers by their interests, check out this step by step tutorial on how to allow users to select MailChimp groups in your WordPress forms. If your clickthrough rate is low, you should start split testing your email campaigns to pinpoint why people are opening your emails but not clicking on the provided links. Just remember, only split test one element at a time to make sure you get the most accurate data possible. If you want some more ways to boost your email clickthrough rates, check out these clever email personalization examples to gain more leads. Your email’s conversion rate is one step past the clickthrough rate in that it measures how many people clicked on a link within your email and completed a desired action such as filling out a lead form or making a purchase. The whole point of email marketing, beyond engaging subscriber’s with valuable content, is to get them to take some sort of action. 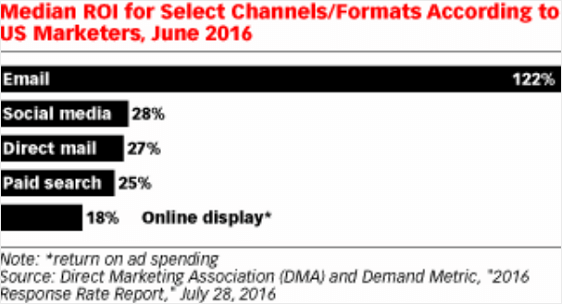 In other words, marketers use email campaigns to get people to convert. In fact, conversion rate is such an important email marketing metric to track, 60% of marketers claim it’s something they always monitor to determine the progress of their email campaigns. The way you get people to convert is to have a clear call to action button somewhere in your email for people to click on. If you want to track your email conversion rates, you’ll need to integrate your email service provider with a web analytics tool like Google Analytics. Luckily, you can easily connect your WordPress website to Google Analytics using the MonsterInsights plugin. With this plugin, you can create custom campaign URLs with UTM codes, right in the WordPress dashboard, that will track the performance of your email campaigns. This way you’ll always be able to measure your email’s conversions. You’ll also know what is convincing people to take action and be able to capitalize on that actionable data. The last email marketing metric you should always measure is the return on investment, or ROI, of your email campaigns. This way you know the money you’re spending on campaigns is worth it. Luckily, email marketing is the number one driver of revenue for many businesses. In fact, according to an eMarketer study, email was found to have a median ROI of 122%, which is four times higher than any other type of marketing. Closely monitoring your emails’ ROIs allows you to see which campaigns are working the best and which ones need improvement. By doing this, you can make sure your business is profitable, long in to the future. And there you have it! The top 4 email marketing metrics that make the most difference when it comes to your success. If you want an additional way to track how successful you are, be sure to check out how to track WordPress form conversions so you can continue to build your email list, send out actionable emails, and grow your business. And if you’re in need of some fact-based statistics about email marketing, as well as lead generation, form conversions, and form abandonment, check out these 101 unbelievable online form stats and facts. So, what are you waiting for? 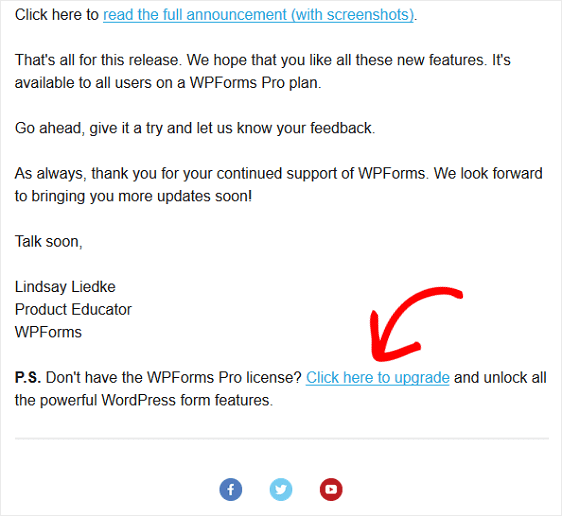 Start building your email list using the most powerful WordPress forms plugin today.